Many schools punish or penalize kids for being late or having to leave early. This practice has long been criticized by parents as penalizing kids for things out of their control such as a family emergencies, getting sick or something as simple as traffic. Sure enough one school did exactly that but got a stern talking to by one grandma who called them out for being unfair. One first-grader was separated from his classmates at school after being late for class that morning because his mother’s car wouldn’t start. Hunter, like most people, was upset because he was being punished unfairly and started crying during his punishment. 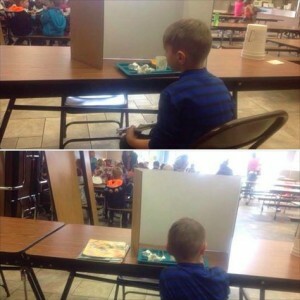 Luckily his mother found him at lunch snapped a picture of Hunter sitting in the cafeteria alone with a poster in front of him at lunch. This is my grandson, Hunter. 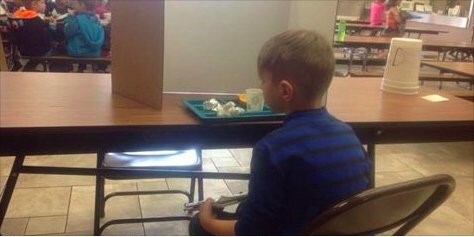 He’s a little first grader. His momma’s car sometimes doen’t start right up. Sometimes he’s a couple of minutes late to school. Yesterday, he was 1 minute late and this was what his momma discovered they do to punich him! They have done this to hime 6 times for something that is out of this baby’s control! They make a mockery of him in front of the other students! The principal is responcible for this. His mom found him there, crying, and took him home that day. Members of the community also tried to organize to fix up Hunter’s mother’s old Durango. But after realizing that the repairs would be too costly to make sense, local businesses stepped in and pooled their resources and gave the family a 2001 Chrysler van. From now on Hunter should be able to get to school on time, and no other children at his school will be punished that way again.